If you work in sales, you’re all too familiar with being ghosted by prospects. You’ve put in the time building a relationship, there’s good dialogue going on, then suddenly … they stop returning your messages. Emails? Unanswered. Phone calls? Ignored. If they could just tell you they’re not interested anymore, you could close their file and move on. But maybe they just didn’t see your messages? Getting prospects to respond solely through phone calls and emails just isn’t cutting it anymore. Stop getting ghosted and build closer relationships with your prospects by incorporating texting into your sales cycle. Here are a few reasons why it works and how the need to re-engage cold prospects could be a thing of the past. Building a relationship with prospects is crucial in the sales cycle because we all naturally want to work with people we like. But a lesser known key to better connecting with prospects is to reach them on the channel they prefer. It’s hard to build a cadence of communication with phone calls and emails when both channels are overused and ignored. Texting, however, is a medium that people love and use every day to chat with friends and family. 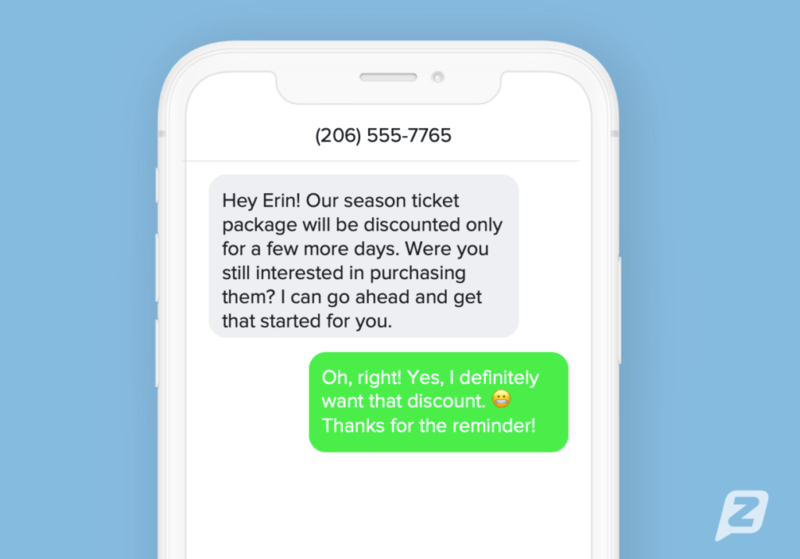 We’ve come to associate it as more personal and more friendly than emails or phone calls, and a majority of us are OK with getting texts from businesses, too: In a recent survey, 73% of consumers said they wish more businesses would use texting to communicate with them. When you’re being ghosted by a lead, it drags out the sales cycle, which only increases the chance of that sale fizzling. But why do leads ghost you in the first place? Maybe your product or service just doesn’t align with their needs, they found a better option or they’re simply not interested anymore. Whatever the reason, you should be making it as easy as possible for them to let you know whether you should keep pursuing them or move along. This is why texting is so powerful in the sales cycle. You won’t need to re-engage prospects if they remain engaged. When you’ve built a good relationship with a prospect, you’re increasing the likelihood that they’ll be more receptive to your messages. In our 2019 State of Texting report, we found that 74% of people will respond to a text from a business within an hour compared to only 41% via email. As for voicemail, people don’t prioritize listening to them as much as they used to. Texting has higher response rates than phone calls or emails because it’s a high-priority medium. This makes it so much easier on your prospects to stay engaged throughout the sales cycle. When prospects can answer your messages faster, your workday becomes more efficient. After you have their permission, here are a few instances you could use to text them. You don’t have to text prospects from your personal phone number to build better relationships. It can be overwhelming to have both personal and business contacts reaching you throughout the day on your phone, but more importantly, there’s no way to keep track of conversations. Instead, you can integrate texting into your current sales platform like SalesLoft. Zipwhip and SalesLoft go hand in hand, making it easy to add texting as an engagement step into your sales cadence. 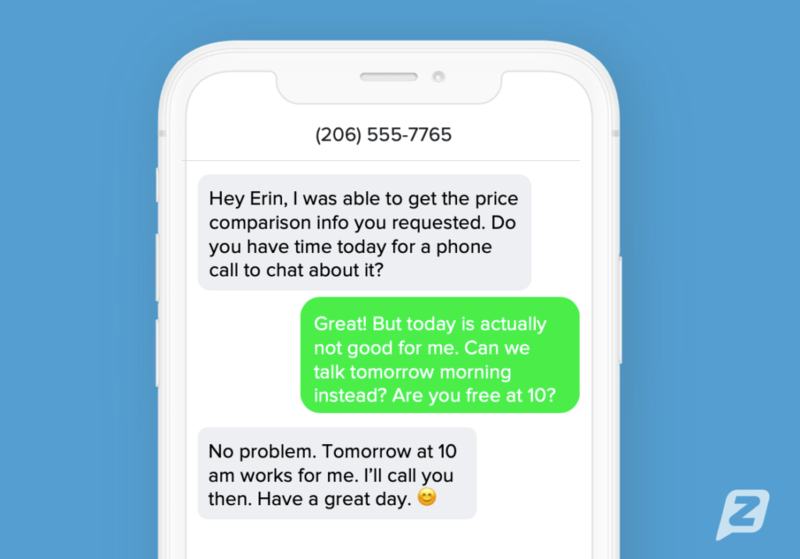 You can text prospects from your existing business phone number directly from SalesLoft’s software on your computer. It’s a better way to keep organized and manage how frequently you’re contacting prospects. If you’re already a SalesLoft user, learn how to integrate Zipwhip texting with this support page from SalesLoft.